Steven Spielberg monumentally sparked our imagination when he released Jurassic Park in 1993. Never before (and hardly since) had moviegoers seen such realistic portrayals of dinosaurs on the big screen. Movie dinosaurs were usually relegated to stop-motion animation, dating back all the way to the 1933 King Kong. However, Spielberg broke the visual effects mold. He combined state-of-the-art computer graphics technology with practical animatronics and made us all believe that dinosaurs did in fact exist. The Jurassic Park franchise has had diminishing returns ever since its inception back in 1993. The original is a masterpiece. The sequel was good but a bit lazier. The third film was short and to the point but had little depth. Jurassic World essentially rebooted the franchise for a new generation, but somehow the dinos looked faker than twenty years before. 2018’s Jurassic World: Fallen Kingdom went completely off the rails. The latest installment relegates dinosaurs to creatures in a haunted house movie. 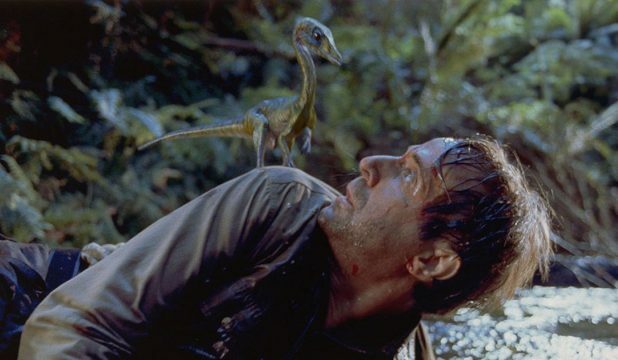 Even so, each movie in the series has at least one incredible dinosaur encounter. The kid in all of us has always, and will always, have a special love for these giant lizards. 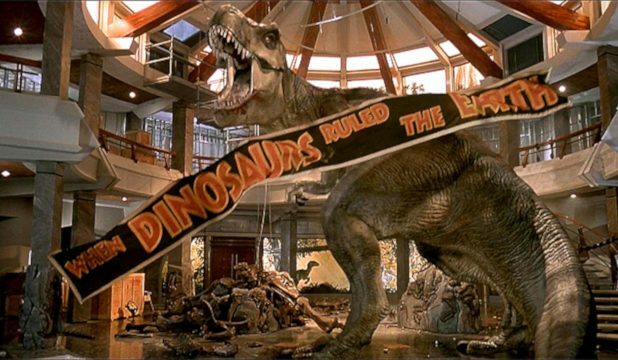 There is no better place than the Jurassic Park films to satiate our imaginations about T-Rexes and Velociraptors. 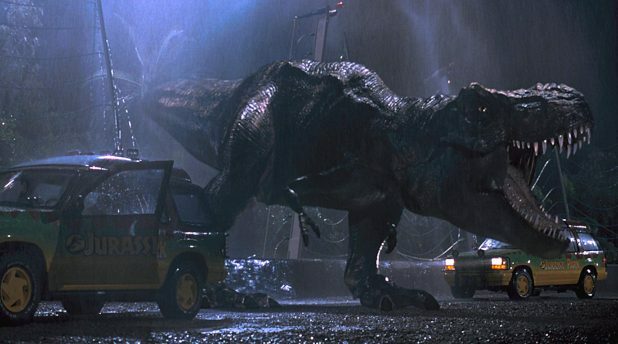 Here are the top 10 dinosaur encounters throughout the Jurassic Park franchise. As stated earlier, Jurassic Park: Fallen Kingdom is a mess. However, it has one scene at the end of the first act that is truly magical. It is also devastating. 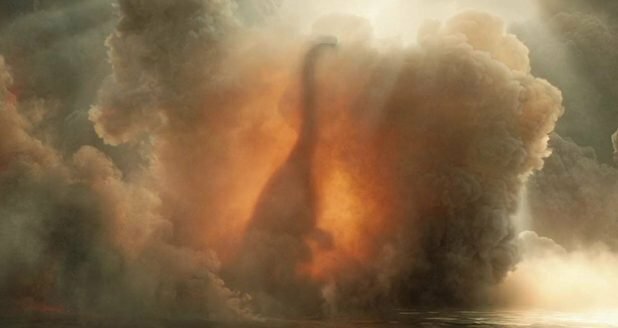 The volcano on Isla Nublar is erupting, and it is going to wipe out the dinos that have been left behind once Jurassic World closed. The disaster footage is exciting and the effects are solid. Chris Pratt and Bryce Dallas Howard just make it on the ship to get them off the island before it kills them. As they look in the distance behind them, a lone Brachiosaurus is walking out on the pier. The poor animal is trying to escape its fate of the encroaching fire and smoke. It is quite a moving scene. 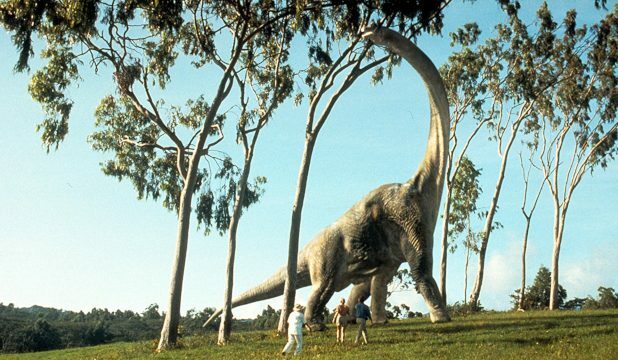 Jurassic Park gave us to the Brachiosaur in all its glory as an introduction to cinematic dinosaurs. To have that species on that pier during that scene has a sort of full-circle poetry to it. In the opening scenes of The Lost World: Jurassic Park, we see a small girl encountering a Compsognathus (Compy). This single, chicken-sized dino quickly turns into several, climaxing with the girl’s mother screaming in horror. However, we see just how dangerous they are when they attack the lost Dieter (Peter Stormare). They swarm him, biting his ears, and his lips, and it looks excruciating. When he tries to run and dives over a log, they overwhelm him and we see the creek below turn blood red. The audience may have thought such small dinos would be harmless. With this encounter, they understand that almost anything on the island can kill them. The Pteranodon is one of the most iconic, recognizable dinosaurs. We only got to see one in the closing shot of The Lost World: Jurassic Park. 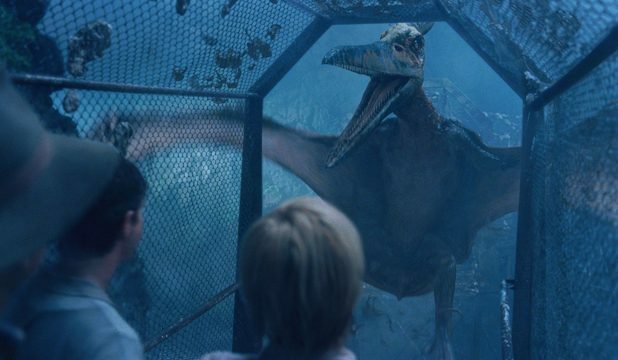 It wasn’t until 2001’s Jurassic Park III that we got up close and personal with one of the winged monsters. As Dr. Grant and his group are trying to cross a rickety metal bridge, they feel a massive shudder. Something has landed on the bridge. Then, out of the mist, we make out one of the giant Pteranodons. It is terrifying. It then takes flight, swiping up Eric on its way. This is one of the best action sequences in the film. Billy base-jumps and works his way to where Eric is being fed to the Pteranodon young. Although, the group of adults was not having it. Early on in Jurassic Park III, Sam Neill’s Dr. Alan Grant is begging his troupe to get back on the plane. That is when the gargantuan Spinosaurus pops out of the jungle and causes the plane to crash. While trying to avoid certain death at the hands of this new monster, the group runs into a T-Rex feeding in the jungle. It is a wonderfully surprising, almost funny development. It comes out of nowhere and it is so unexpected. Then the audience is treated to a 1-on-1 challenge between Spinosaurus and Tyrannosaurus Rex. The Spinosaurus makes very short order of the T-Rex. It perfectly lets us know that this new dino is no joke. She will be a force to be reckoned with throughout the film. 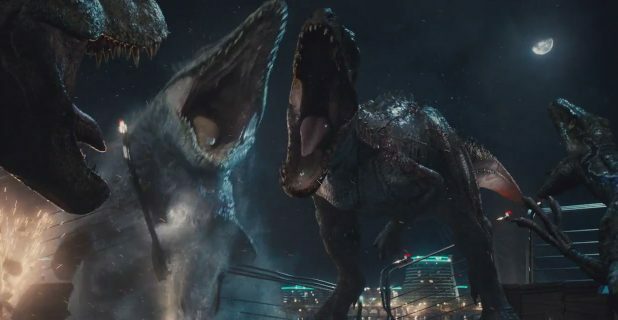 Most of 2015’s Jurassic World was a lot of the same. Rich man builds park of dinos, park goes down, dinos attack. However, the climax of the film is spectacular. The Indominus Rex has been causing mayhem throughout the entire park and is seemingly unstoppable. That is of course until Claire enlists the trusty T-Rex and sics it on the killer dino. The T-Rex is not much of a match for the Indominus until Blue, the brilliant velociraptor tags in. What follows is a gloriously absurd Battle Royale between the Indominus, the T-Rex, and Blue, that all culminates in a surprise appearance by the spectacular aquatic Mosasaurus. Early on in Jurassic Park, before the park goes offline, the tour group hears a description of the Dilophosaurus. A dinosaur that spits poisonous venom? Wow!! But it is nowhere to be seen. It isn’t until much later, while Dennis Nedry is trying to make it to the docks, that we finally get to see her. Nedry happens upon the small, delicate looking creature and is happy it isn’t one of your big brothers. Then those fans on the side of its face open up, and it is a thing of nightmares. 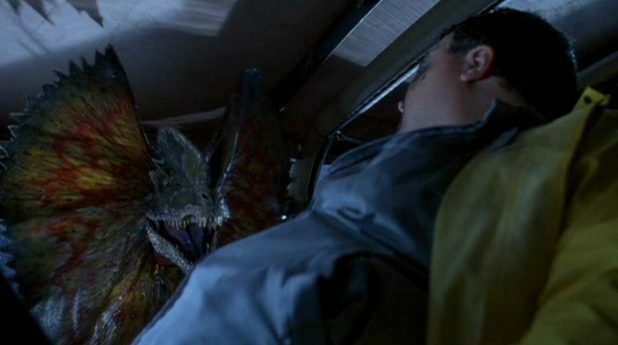 When Nedry gets himself back into the Jeep only to see the Dilophosaurus in the passenger seat, it is one of the greatest kills in the entire franchise. The Lost World: Jurassic Park has a good handful of action sequences, but none of them compare to the trailer scene. Sarah, Nick, and Ian were helping set the baby T-Rex’s fractured leg. The parents don’t like that and try to push the accordion trailer off the cliff. The progression of the mayhem is perfect. 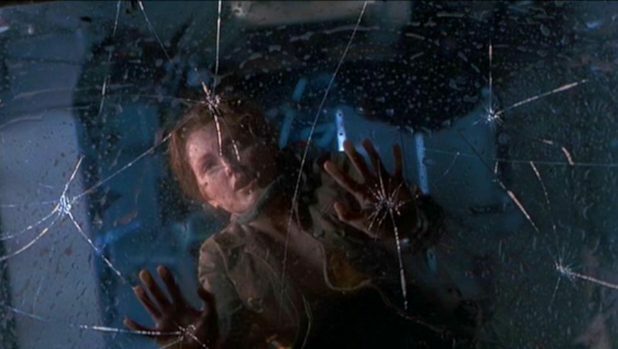 Then, when Sarah falls onto the back window that slowly begins to crack under her weight, it is classic Spielberg-ian mastery. Not only that, but Eddie’s heroics in trying to keep the trailer from plummeting are cut short with arguably the most graphic death in the franchise. There is only one way for two T-Rexes to kill a single victim. In the original Jurassic Park, For a decent stretch of screen time, John Hammond is purposefully mysterious about his park. He does not want to spoil Dr. Grant’s and Dr. Statler’s surprise at viewing his genetic creations. They are brought to jaw-dropping awe, just like the audience, when the majestic animal strolls into their path. It is a perfect introduction to the world of Jurassic Park. There it is, that beautiful creature, and it looks so real. The characters think to Hammond, just as the audience thinks to Spielberg; How’d You Do This? Hammond’s reply, and therefore Spielberg’s reply is perfect. I’ll Show You!! The poor kids of Jurassic Park. They always seem to be in the most danger. It is a good cinematic technique because having kids in peril is harder to stand than when adults are. 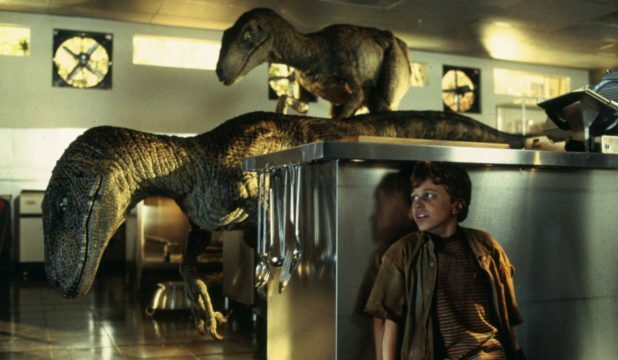 Lex and Tim are never in more trouble than when they are trapped in the kitchen with two velociraptors. The entire film, we are told about how deadly and smart these creatures are. So to see poor Lex and Tim in an amazingly tense cat & mouse situation with them is terrifying. The timing, the editing, the sound, the absence of music; it all so perfectly pulls you to the edge of your seat. This is the scene that catapulted Jurassic Park into cinematic history. Anyone that ever had any interest in dinosaurs was looking forward to the Tyrannosaurus Rex the most. When the goat leg slams into the roof glass and the paddock wires begin to snap, every moviegoer in the country gasped in horror. Even to this day, that T-Rex looks 100% real. As it assaults the tour vehicle with the kids in it, the tension, fear, and carnage just become unbearable. In 100 years, when film historians discuss Jurassic Park’s legacy, this is the scene they will reference. From the moment the impact tremors disturb the water glass to the final roar, it is perfect cinema. By injecting the T-Rex into our collective nightmares, Spielberg forever solidified her as the queen on the franchise. 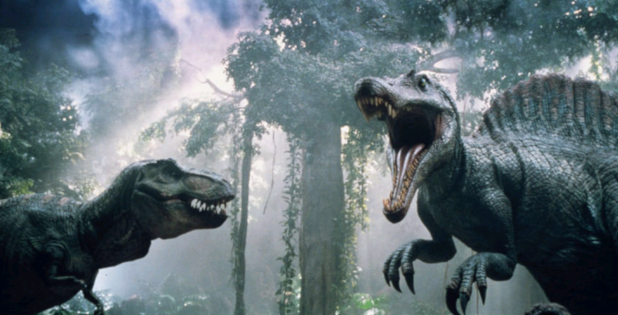 The post The 10 Best Jurassic Park Dinosaur Encounters appeared first on ComingSoon.net.